The hand woven rope is restoring ancient ways design. Elegant style, Artificial craft production. Appealing hand woven wall planter constructed of natural fibers. Give you a fashionable household life and a different rural life. Very very cute! They seem very sturdy and good quality. Simple and fit nicely into any decor. I bought a shelf bracket and some planter S hooks from homedepot to hang off my wall in my room (rental apt so hanging from the ceiling isn’t happening). I bought 5.5in pots and 2 different plants from Home Depot to put in and agree that smaller pots the plants will have slightly less room so you may have to adjust the stems and leaves of your plants so they don’t get crushed. I have both hanging off of one hook as I’m trying to find the best place to move one to but for now they look good together!! 5.0 out of 5 starsAwesome quality! I love the quality of Mkono hangers! I've tried others here on Amazon and they just don't compare. 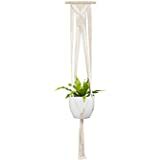 I bought these in a set of 2 because it was such a good deal...hung one in our guest bathroom with a spider plant and am looking for another spot for the second hanger. Highly recommended! I will be a return customer for sure! Such a good deal, well made and good quality. I even put a 10" ceramic pot in it and it fits just fine. I will be ordering more for Christmas gifts. 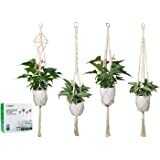 Perfect for all my Pothos hanging in the house! Subtle but waaayyy better than the plastic hangers included with the pots. I will be ordering more!!! 5.0 out of 5 starsSuch a pretty plant hanger! Very high quality for a GREAT price! 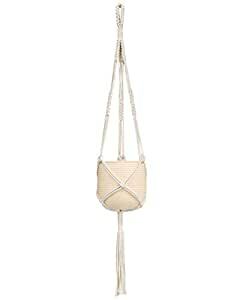 Super sturdy and the handcrafted details on the macrame are gorgeous! 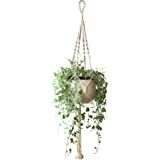 Simple design but a must have for hanging plants.